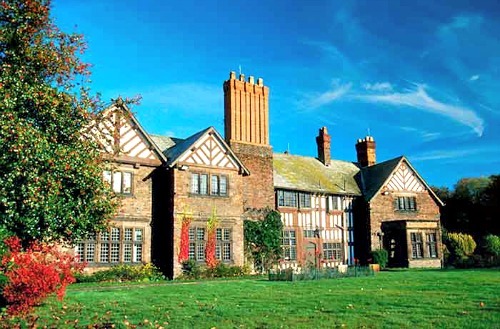 Wardley Hall is a Grade I listed building and one of the few surviving fine examples of an early medieval manor house. The hall which stands today was constructed around the year 1500, but there has been some kind of status building here since at least 1292, which is when the moat has been dated to. The house underwent extensive renovation and had parts rebuilt during the 19th and 20th centuries due to its original timber frame and slate roof being damaged due to age. The restoration in 1894 was the biggest change to the halls original structure and was carried out by its owner at the time, John Douglas. This was one of the only buildings in the North-West to be mentioned in the Domesday book and today is home to the Roman Catholic bishops of Salford, though for 200 years of its life it was known as "skull house". There is a skull displayed in the house which sits in a niche at the top of the main stairs. It is believed to be the skull of St Ambrose Barlow, who was one of the 40 martyrs of England and Wales. He was hung, drawn and quartered on the 10th of September, 1641 after confessing that he was a Catholic priest. The house stands as a private residence to the bishops of Salford but they have been known to accept guests in to view the house and the skull. If you wish to visit please respectably go through the proper procedure and contact the house directly for appointment. I bet you cant guess what the haunted object in Wardley hall is can you?, that's right, it is indeed the kettle, which makes ghostly tea throughout the night, either that or the skull, I forget sometimes. There is a legend which surrounds the hall and the skull and its the reason it was known as "skull house" for 200 years. When the skull was first retrieved from the body it stood in its place in the hall, with no problems, but things took a frightening turn when a new owner to the house tried to remove the morbid object. First the skull was buried in the grounds, which caused all sorts of problems in the house, such as objects being moved and even thrown around, and doors slamming with such violent force they shuck the room. Since this only started when the skull was put in the ground it was promptly dug up and put back in its place. The next time a new owner tried to remove the skull it was thrown into the halls moat, which caused a series of storms so frequent and violent that they ripped tiles off the roof and broke windows. The whole of the moat had to be drained to find the skull again and when it was put back in its place, the storms stopped. The skull has a few other stories attached to it, such as one which tells of it bewitching people who do not show it the level of respect it deserves. It has also been said that it will scream during the night if it is placed anywhere in the house other than its place at the top of the main staircase.